Admittedly, last year wasn’t a favorite and I’ve decided to be kinder with myself about it all. We uprooted our wonderful Colorado lives. 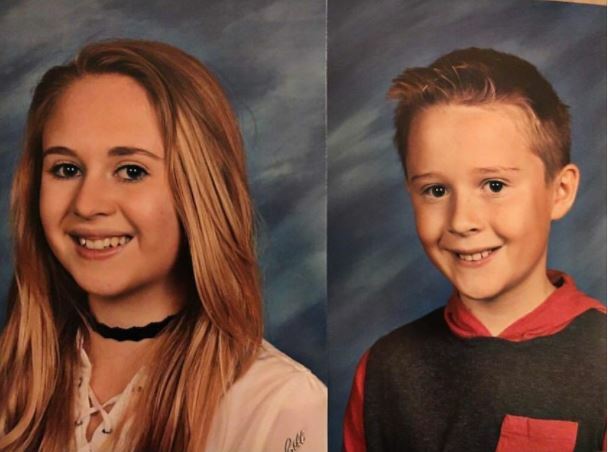 Raising struggling teenagers is hard. Navigating injuries can be depressing. Health problems put what really matters into perspective. Trying to find purpose in this strange, new world takes time. There is always hope. I’m just ready for 2017 to be behind us and I already have several appointments and courses in place to ensure we get back on track in 2018. It’s tough to feel like a horse in the starting blocks, and being repeatedly told be wait. Have patience. And the time to race is not yet at hand. But I feel like things are slowly coming together and this will be the year I start to have some perspective as to why we’re here. At our tithing settlement, our Bishop challenged us to make 2018 the best year yet. I’ll admit I initially balked at his suggestion. We’re still very much in limbo and our glorious Colorado lives of endless travels and children unfettered by the world’s challenges are over. We’ve left our Garden of Eden and it has, at times, felt like Utah is our lone and dreary world. But then I look back on our journey about how far we’ve come. We’re making friends and formulating real relationships. I am getting offered solid freelance opportunities without even seeking them out. Jamie’s business continues to grow. We live in a beautiful place that feels like it was hand-picked for us. We have his beloved family nearby. Life is good despite all of its messiness. I’ve recently had a renewed appreciation for the 12 years of my kids’ lives in Colorado. When you’re in the murky middle of it, you rarely see the successes, only the struggles. How grateful I am I was able to stay at home with them; I never missed a class party, a recital or a volunteer opportunity. Building a business on my own terms that centered around them gave us freedoms and opportunities to explore our world that most never have. We hiked and skied hundreds of miles together, discovered Colorado’s greatest haunts and we instilled within them a love of adventure and happiness. Then came Utah. I’m more determined than ever to ensure that Colorado was not the best chapter in our lives. My friend Lisa posted this quote and I love it. Tip of the day: When you look back on 2017, don’t think of it as a year of pain but a year of growth. You made it through each day. You should be proud of yourself. You are a better you, despite all the hardships. Take a deep breath and enter 2018 with hope and confidence. I’ve always barreled forward with everything in my life and fear hasn’t ever held me back. If I wanted something, I went after it and if I didn’t get it, something even better came along. That’s the beauty of optimism. No looking back, no regrets. But this move required a lot of great sacrifices that were at the core of my very being and figuring out a new sense of self has rocked that core. So, my word for 2018 is courage as I figure out a new path and accept that the old one is gone forever. Middle school: the death of the dream. 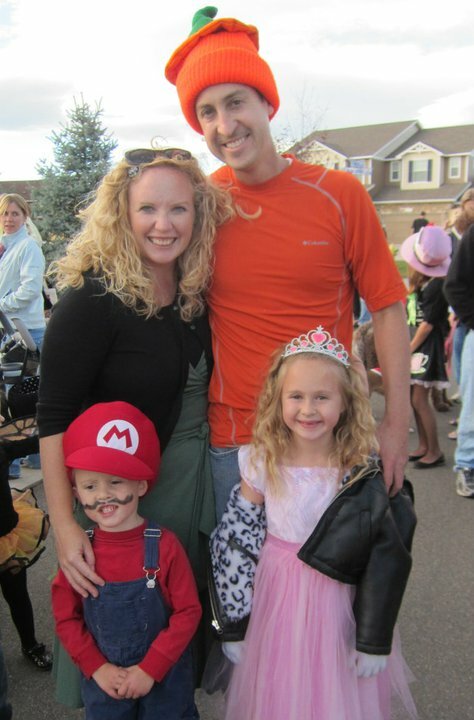 Mario and Princess Peach during happy neighborhood parade in 2010. The rest of my plans have been grounded because now I’m sick. I don’t know how to get a simple cold because almost every time, it evolves into a nasty sinus infection. Add that to all the sad, crummy things that are going on in the world and I’m definitely feeling the weight of it all. I got the call back for the third interview and it went fabulously well! Her parting words to me were, “We want to move quickly with this. Next steps are the background check” so call me crazy, but I figured I was IN…just without the official job offer. So, I patiently waited. And planned. And started restructuring my life for going back to work. It was three-quarter time, which was the perfect fit because it was super flexible and paid well. Financially, things are so tight and it doesn’t help that my car is basically dead so we knew we had to buy a new car. And then I heard back today and was told they offered the job to someone else. She’s right about the bitterness part. I’m still in mourning but it has instilled within me the resolve to find something even better and that I’m just as passionate about. I don’t want just any position to pay the bills. I want something that really lights my fire so the search is on. Well, once I get better, of course. Now, excuse me while I go blow my nose. 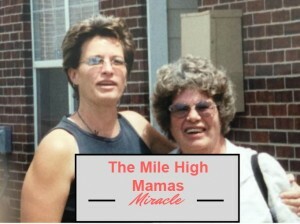 Happy 10-Year Anniversary to Mile High Mamas! I was recently invited via one of my contacts on LinkedIn to tell the story of how I started Mile High Mamas and I realized September marks the 10-year anniversary of when we launched Mile High Mamas in 2007! I moved to Denver in December 2003 and got married in February. Six months later, we decided to start our family and I was thrown into the whirlwind that is motherhood with a healthy dose of humility. 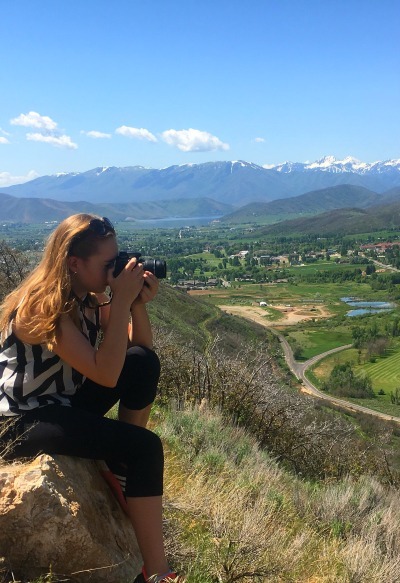 I had moved to Colorado at the peak of my media career and my navigation skills for this new life were dismal, particularly when I gave birth to a beautiful but colicky daughter in 2004 who frequently voiced her displeasure about my parenting skills. I felt isolated and alone. Writing had always been therapy for me so when my friend Kristy started this new thing called “a blog” on (now defunct) MSN Spaces, I was intrigued. A community of writers a.k.a. “bloggers” baring their souls and making friends while they did it? I was all-in and started my first blog, Crazy Bloggin’ Canuck, as a nod to my Canadian roots. I’ll never forget the first time CLICK TO KEEP READING. It’s been a big week at the Borowski house! My parents celebrated their 50th wedding anniversary, it’s my mom’s birthday today and my brother Jade is getting married next week. Normally we’re in Calgary by now but Hadley is at Young Women Girl’s Camp until Saturday so the kids and I are driving north on Sunday (yes, I’m dreading the 13+ hour drive by myself); Jamie will fly out later to join us for the wedding. It’s been a tough year for my mom. Her MS has increased to the degree she has no quality of life and sleeps most of the time. Most of my contact has been with my dad because she can’t hear very well and is no longer very coherent. This is the first summer she won’t make it to the lakehouse because she can’t travel anymore. I miss her everyday and really miss my kids never knowing the dynamic, funny, talented, glamorous spitfire that I’m proud to call my mom. One of my favorite funny memories of her was when I was about Bode’s age and there was a traveling carnival in the Deer Run mall’s parking lot. We decided to go on a few of the carnival rides including one called “Rock ‘n Roll.” As we boarded the cages, we thought we were in for a nice rocking and rolling back and forth but unbeknownst to us, it actually rolled upside-down….and kept rolling. (Hence the aptly named Rock ‘n Roll). My mom hates rides like that and she had neglected to zip up her purse so its contents were flying all over the place, along with her steady stream of obscenities while I laughed the entire time. Ahhhh, good times. Happy birthday, Maman and we can’t wait to see you next week! As I’ve mentioned previously, the last few months in Hadley’s world have been tough. If you have any doubts what a nightmare middle school is for girls, watch this seventh grader’s poem that went viral about the pressures of seventh grade. The good news is now that she’s removed from that social environment, we are seeing our beloved spitfire starting to reemerge. One of the results of her downward spiral were her grades–she went from the honor roll and feeling on top of the world the first two terms to a couple of Ds and several Cs as she struggled to turn her work in on time and stay on top of her exams. To her credit, she clawed her way out, ending up with all Bs and As but it reconfirmed that we need to hire a math tutor for eight grade because that was one of the triggers for a lot of her stress. She got a phone and texting plan on her old iPod for her birthday and her first texts to me were 1) “Come get me” (during a lame assembly). And 2), While I was mountain biking, I got several texts from her while she was at an end-of-year event at school: “I’m bored.” “Entertain me.” Because I had nothing better to do. 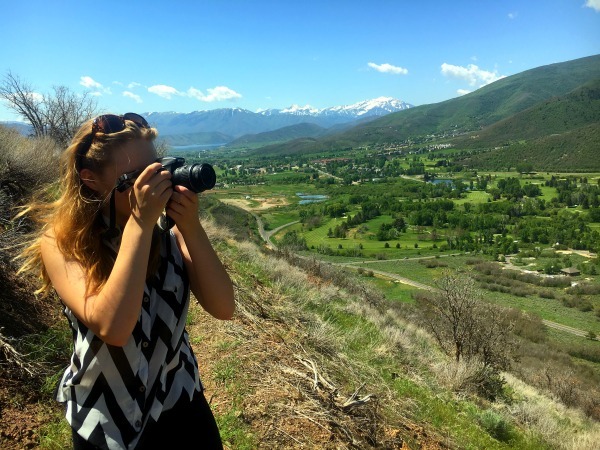 She has put her love of art, drawing and painting on the backburner and has a new interest in photography. Her main Christmas present was a new Canon and since spring has sprung, she has become more excited about it (this is also likely related to her new Instagram account and desire to take good pictures). 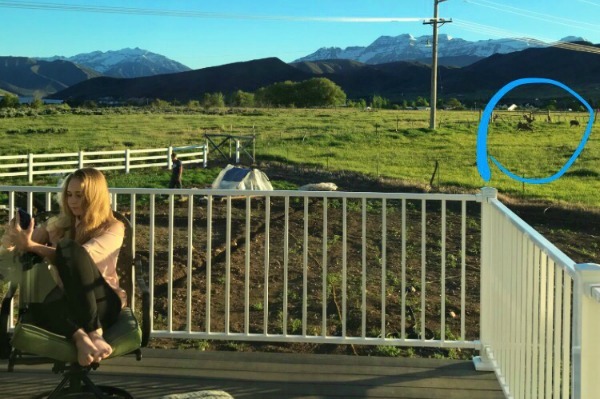 I took this picture when she was a 2-day-old teen: She slept in until 1:30 pm and she didn’t notice the deer photobombers as she took her profile pic for her new Instagram account. P.S. Yes, that would be the Pumpkin Man in his patch even though he has been suffering with debilitating vertigo the last few days and I had to take him to the hospital clinic. BECAUSE EVEN IF YOU CAN’T WALK WITHOUT PUKING, PUMPKIN SEASON MUST GO ON. She convinced me to let her skip the last half-day of school so we could go hiking on the WOW Trail. The kid knows how to manipulate me in the best ways. She somehow finagled herself a shopping trip to Park City to buy her new socks…and she came home with everything but socks. 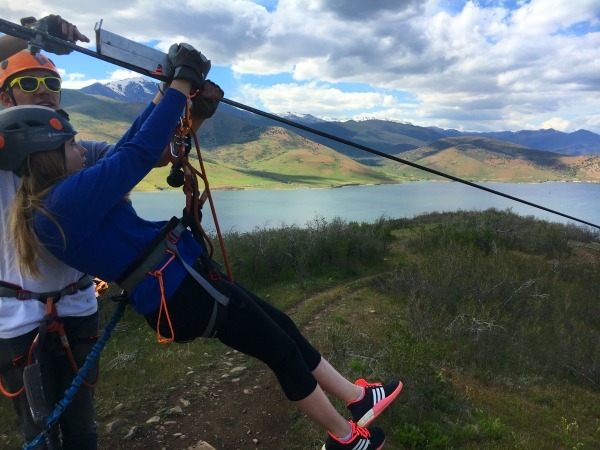 I was working on an article for Discover Utah Magazine so Hadley had two zipline weekends in a row. 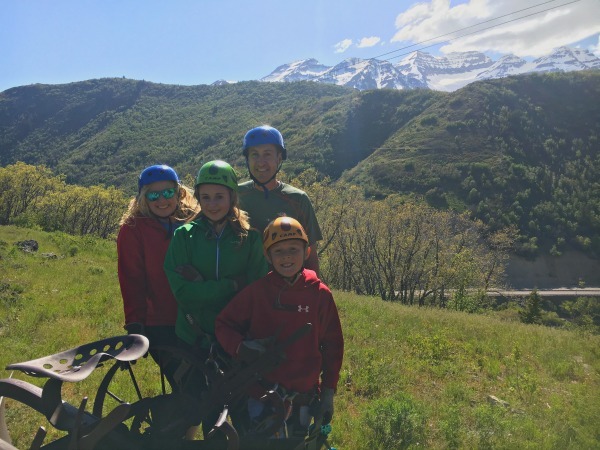 The first was with the entire family at Adventure Zipline Utah, a super fun and casual canopy tour with plenty of adrenaline-charged moments. We were encouraged to do all kinds of zany stunts–our guides even did front flips off the platform! 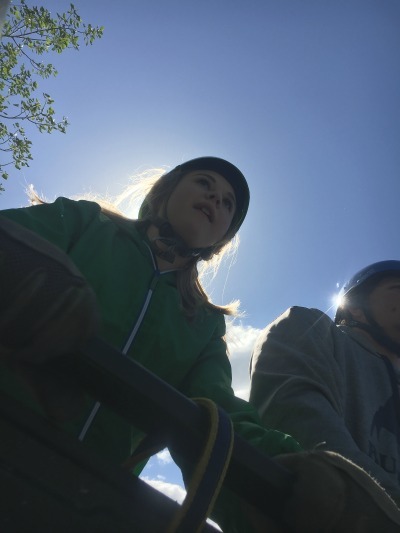 Hadley’s adventure started during the 4×4 drive to the top of the course where she had to stand at the back of the vehicle, clip in her carabiner and hold on. 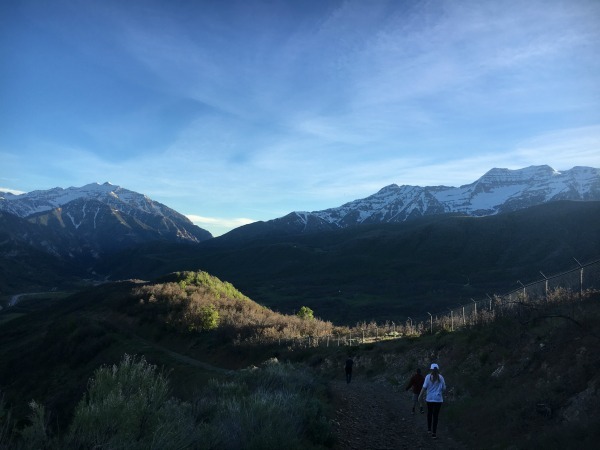 Those views of Mount Timpanogos aren’t bad, either! 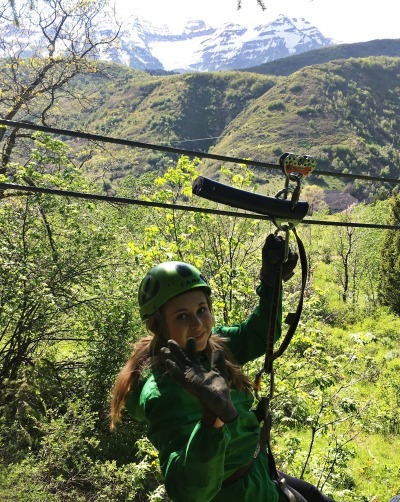 The following weekend, Hadely and I conquered Zipline Utah overlooking Deer Creek. 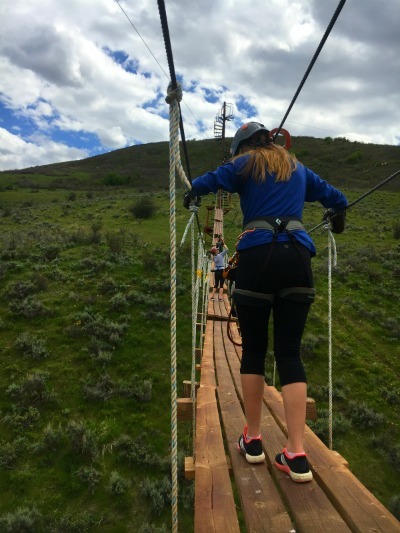 There are plenty of tour options available and we selected one of their more more extreme courses–8 ziplines and 2 suspension bridges. Our feet didn’t touch the ground the entire 2-hour tour as we flew from platform-to-platform, climbing lots of stairs. 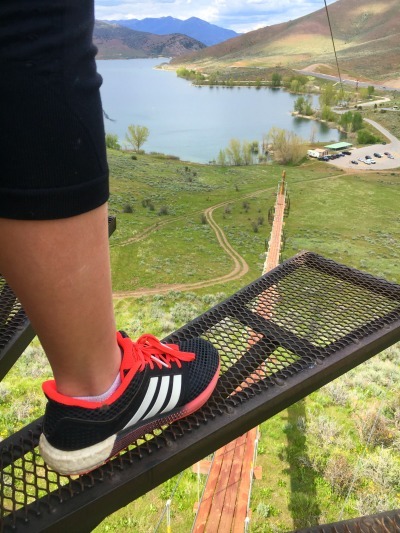 I wouldn’t recommend this tour for the beginner but we still had loads of fun, with the exception of the second-longest zipline on the course where I crash-landed on the platform. Not too fun and probably terrifying for our guide to see me careening toward him at 50 mph. That bad landing made us both nervous to try the Screaming Falcon, the longest zipline in the world over water–3/4 of a mile–but our guide assured us there was a different braking system on that zipline so we decided to go for it (especially after we saw on the guide’s DOG doing it; he even had his own harness!) We were apprehensive as they drove us to to the top of the mountain with the platform. Adventure Girl went first and it was a thrill to watch her disappear over water and it was my turn next. The sheer velocity made it difficult to catch my breath and I regretted not doing up my coat because it was flapping all around me. But it was truly one of the most exhilarating things I’ve ever done! 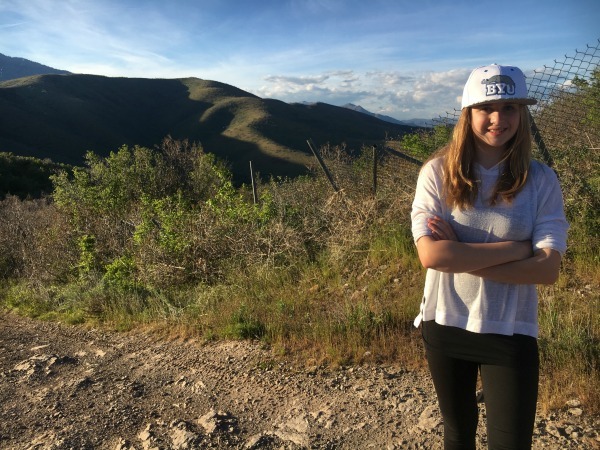 One night for FHE, we let Hadley choose the FHE activity and what started as a casual stroll ended up having a 2,000-foot elevation gain. 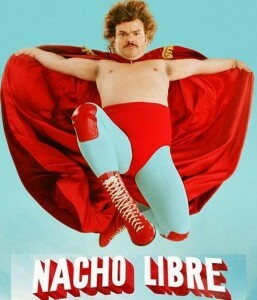 My friend Cheryl has been a longtime devotee to the 2006 American sports comedy film, Nacho Libre. If you haven’t seen it, Jack Black plays a character who works as a cook in the Mexican monastery where he grew up. The monastery is home to a host of orphans whom Nacho cares for deeply, but there is not much money to feed them properly. Nacho decides to raise money for the children by moonlighting as a Lucha Libre wrestler with his partner, but since the church forbids Lucha, Nacho must disguise his identity. I know your life is totally changed from reading that paragraph. I’m not one for stupid humor and Napoleon Dynamite is one of the few corny cult classics I enjoy but the kids and I decided to watch it one evening and laughed our heads off the whole way through. Apparently Jamie was remiss to miss out on the fun so he announced to me a few weeks later that he, too had watched Nacho Libre. “Do you feel like your life has changed?” I asked. Apparently, we have a very low bar for equality in our household. I was biking home after dropping off my kids at school when my iPhone rang. Little did I know that message would be the makings of The Mile High Mamas Miracle. Every Mother’s Day, I issue an invitations for Denver moms to tell their story. One year, it was their own experiences in becoming a mother; for another, it was their favorite mom moments. Last year, I launched a Mother’s Day contest where entrants wrote an essay about their Mom Hero–whether it was their own mother or a peer or someone they admired. All of the entries were so inspiring and I published 20 of them the week of Mother’s Day. With so many amazing stories, I knew I wouldn’t be able to choose (plus, I felt I was biased because I knew some of the women who submitted). The Grand Prize winner would receive a day of pampering for two at Allure Skincare and Lash, True Bliss Massage AND Rooted in Tradition Acupuncture so I asked the PR rep of the salon to make the final selection. She chose Brenda Lane’s My Mom, My Hero, Advocate and Artist. As a side note, I was in the middle of a very stressful season of my life. We were [unsuccessfully] selling our home, permits were delayed on our new one, I had umpteen end-of-the-year responsibilities–from recitals to graduation parties to assisting at a wedding reception to my daughter’s own birthday bash and Sixth Grade Continuation. The timing is an important note in this miracle because it was almost two weeks after Mother’s Day when I finally emailed Brenda to let her know she had won. I didn’t hear back from her. Five days later, I emailed the PR rep to see if she had made contact. She hadn’t so we resolved to call her. That was before I received the message on that fateful day while riding my bike home. It was from Adriana, Brenda’s partner of 15 years, who requested I call her back because she wanted to to share the beautiful backstory of Brenda winning the grand prize. The experience that unfolded was the makings of miracles. Adriana shared that just eight weeks ago, Brenda’s mom Sylvia had been living a busy and happy life as she finished illustrating a children’s book when she experienced some back pain. 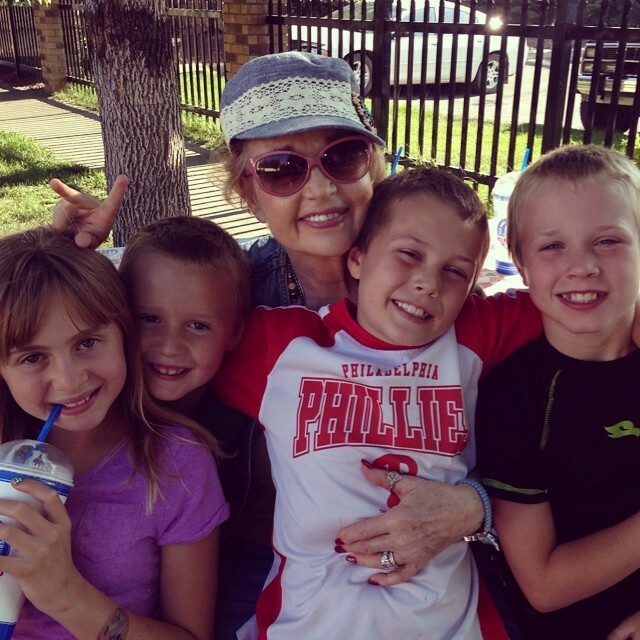 The next weeks that ensued involved a visit to the ICU, a nursing home, hospital visits and finally, her health had declined so rapidly that it was time to send her home with hospice. So Brenda stood by her Mom’s bed and shared the news that her “Mom Hero” entry had won. Adriana read the essay to her mom in what would become her final lucid moments. “It was the last gift, the last words Brenda was able to share with Mom,” said Adriana. Sylvia Lane died four hours later. Here’s the thing. Our Mother’s Day hero contest wasn’t some big nationwide competition but for this family, it was a touching reminder that by small and simple things, miracles happen. Last week was rough. Though I’m grateful Mile High Mamas continues to be a popular Colorado resource, it’s disheartening to be constantly reminded of what I’m missing. I’ve been working on a Denver summer activity guide and I’m mourning the loss of all my favorite adventures. The event and travel invitations have been flooding in and though we’re visiting Colorado this summer, I’ve had to pass on most opportunities. A friend asked if I miss being the “IT” girl with all-things family and tourism at my fingertips. I definitely do but also don’t feel like that is the path I’m supposed to take here in Utah so it’s frustrating not surging forward like my usual ambitious self. Plus, I was sick sick sick for a few days and I was in a certifiable funk. Jamie and I started a healthier regimen and things have really started clicking for me this week as I’ve resolved there are so many things in my life that are out of my control but since our move, I’m finally getting back into a routine of working out and eating better. In just five days, I feel the difference. I’ve never disliked being here…almost immediately I fell in love with this charming valley but there is still so much rebuilding–with our home, personally and my career–that needs to take place. I’ve been missing my friends so sent a text to my local snowshoeing group to see if anyone would be interested in doing the Dirty Dash 5K with me in June. I had a blast doing the Mudderella and Diva Dash in Colorado and figured it would be swell to train for something, even if I’m still trying to figure out how to do that with two injured knees. At first, I only heard from the women who were out of town that weekend and I started to give up but slowly but surely, the registrations started coming in. And coming. We’ve had 15 women sign up to be on my team, many of which are going waaaaay out of their comfort zone to do it. 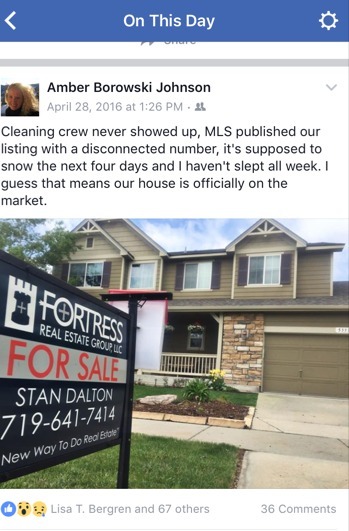 My Facebook memory from a year ago today was the very beginning of what would be a hellacious multi-month ordeal in selling our house. We may have a long way to go but I can’t discount how far we’ve come. Another one from the draft folder, dated Oct. 12, 2015. Our elementary school has a cross-country team for grades 4-6. I really wanted my daughter Hadley to join because she’s a talented runner but she was reluctant, citing she’s more of a sprint and middle-distance runner, not long distance. Fair enough. 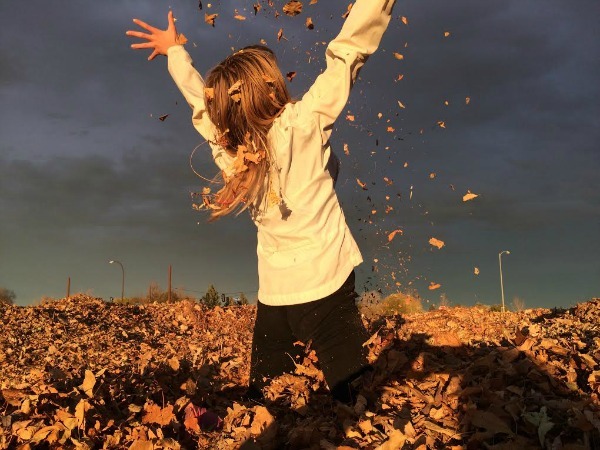 I’m wisely learning to pick my battle with my tween so made the deal that if she joined, I wouldn’t make her do any of the meets…that she could just do it for the joy of running. 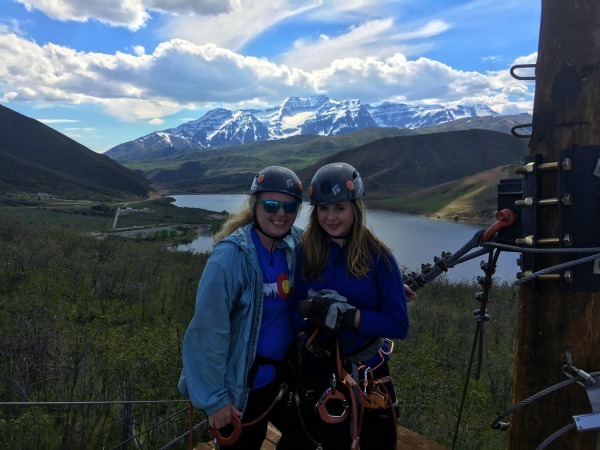 I motivated her by promising that her increased fitness and endurance would help her with hiking, something she is passionate about (read about her first 14er she climbed last summer). Bode is many things but a runner is not one of them. First, he has my side of the family’s build (short and stout), not long and lanky like Hadley from the Johnsons. Second, he jerks his head around like a bobblehead because he thinks it makes him run faster. Third, he’s never shown any interest in running and thinks our longer hikes are downright painful. To his credit, he has enthusiastically attended all his twice-weekly practices, even during sweltering temperatures. And in typical optimistic Bode fashion, he never complained. Another perk I hadn’t anticipated: he has never been better at soccer. That kid can run faster and for longer, which has increased his confidence and enthusiasm for the game. It has been a joy to watch him this season. I kept my promise to not make my kids actually compete until Bode casually mentioned he wanted to try one of their meets. I picked Bode up early from student council and we tore over to a neighboring school that was hosting. He was delighted that in addition to his own peers, most of his soccer team’s buddies were racing as well. Denver hadn’t seen rain in what felt like months so, of course, the sky was heavy with dark, drooping clouds. A few raindrops started falling so the organizer made the decision to start the boy’s race a bit early. The 1-mile course covered a series of hills and I quickly lost sight of him. Most of the parents ran for cover but I stubbornly stood out there getting pelted. If my boy was going to run through this weather, I was going to be there to greet him at the finish line. Besides, if anything, seeking shelter from the hail would just make him fun raster, right? As Bode rounded the final hill, I shouted, “Run, Forrest, Run!” Of course, he didn’t understand the Forrest Gump reference but I beamed with pride as I watched my “non-runner” run his guts out to the finish line. Bode was drenched and his skin flaming red from getting pelted by the hail but he was beaming. Out of a field of about 40 boys, he took 12th, narrowing missing the top 10 medals but he didn’t care. 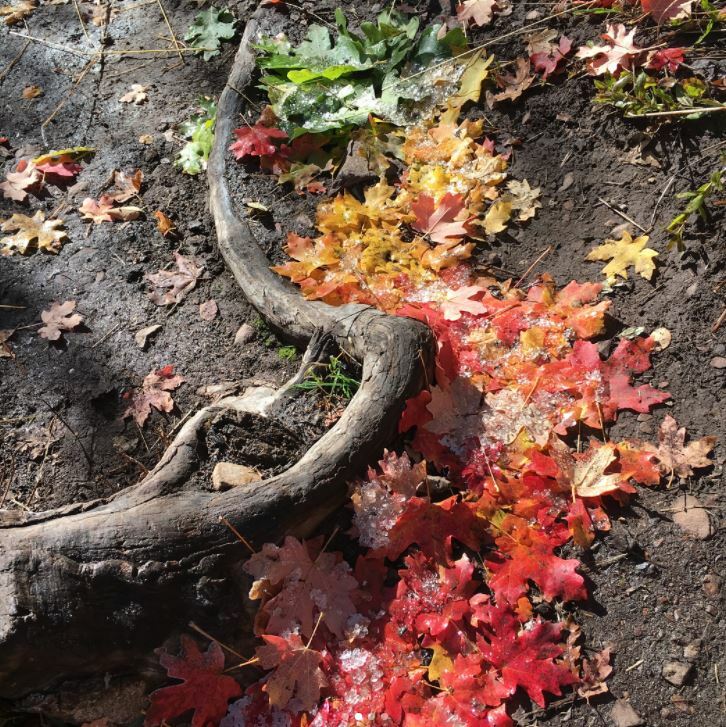 His first cross-country race taught me a thing (or 12) about what it means to be a runner. And it’s not about running.He’d tried something new that was hard for him and he did his very best. For him, that was enough. Though, unlike Forrest, he unambitiously stopped at the finish line instead of running from coast-to-coast for an additional three years.